Dr. Lori Gail Hankenson trained at O.H.S.U. Medical School and completed a pediatric residency at the University of Connecticut. Dr. Hankenson completed a post-doctoral fellowship in Genetics and was Chief Resident in Pediatrics at the University of California at Irvine before returning to Portland. Dr. Hankenson worked for Emanuel Children's Hospital and Clinics before joining Westside Pediatrics. 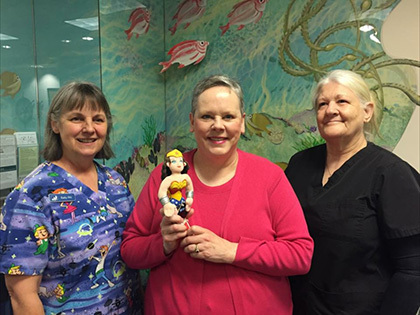 While at Emanuel Hospital, she also served as the Chair of the Craniofacial Team. Dr. Hankenson is board certified in Pediatrics and is currently the Attending Physician at the Center for Medically Fragile Children at the Providence Child Center in SE Portland. She was also the past Director of the Department of Pediatrics at St. Vincent Medical Center. In her spare time, Dr. Hankenson enjoys sewing, gardening and refinishing tables from Goodwill. She is married to a pathologist, Steven, and has two sons, Joseph, age 29 and Prescott, 22. She lives not far from the office in Cedar Hills.